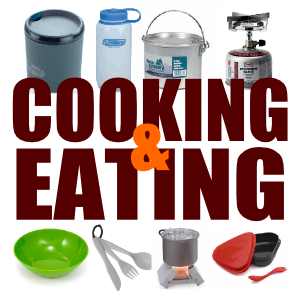 My choices for cooking gear and stoves are inexpensive (or free) and practical. 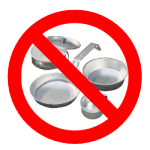 For decades, the default cooking gear choice for Scouts was the metal clamshell mess kit. I don’t recommend mess kits! 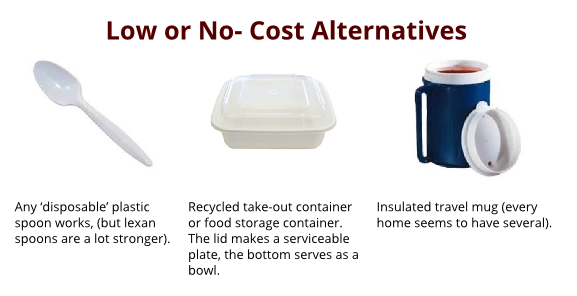 Hot food does not cool as quickly in plastic cup, bowl or plate as it does in metal ones. 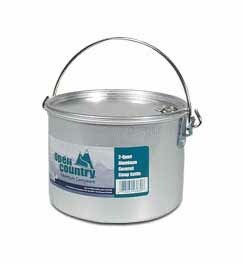 The mess kit pot is holds around 8 ounces of water, barely enough to fill the smallish plastic cup. An average metal mess kit and utensils weighs 16 ounces, a plastic bowl, spoon, cup and a much more generously sized 2-quart pot weighs 12 ounces. A bowl, a plate, and a spork (combined spoon and serrated fork). The spork is made of a tough polycarbonate material and the rest is made of PP (polypropylene), an environmentally friendly plastic. Lightweight, flexible polypropylene material is easy to pack, stack and carry. 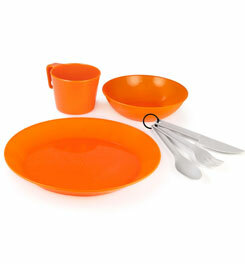 Can be purchased as a kit or separately (see utensil set above). The kit includes: 6 in. bowl, 9.5in. plate, 12 fl. oz. cup, tablespoon, fork, knife, plastic ring, mesh bag I like an insulated mug, and this one features an insulating foam sleeve and sip-it lid. Capacity 17 fl. oz. 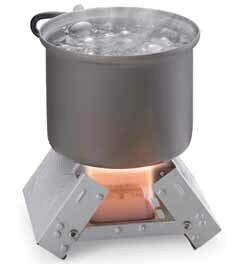 Scouts do not usually need individual cookware or stoves. When Scouts go camping they are camping with their patrol, and this means the patrol is cooking as a group, not as individual Scouts. Before you go to the expense of outfitting a Scout with these items check with your troop and see if they will be needed on a regular basis or not. 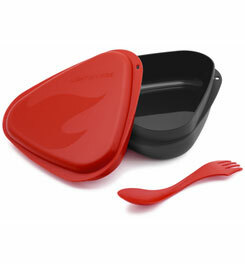 Aluminum pot and lid, I store my stove, mug and spoon inside. 4 1/8″ x 6″ Wt. 7.36 oz. I am convinced we need to rethink using wood for fuel not only to sharpen our skills but also to minimize our impact. 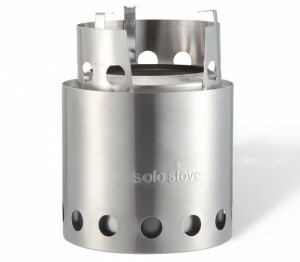 The double-walled Solo Stove is a “natural convection inverted down gas gasifer”. Air intake holes channel air to the bottom of the fire and direct warm air up between the walls creating a burst of preheated oxygen causing a secondary combustion of the gases (smoke) given off by the burning wood. 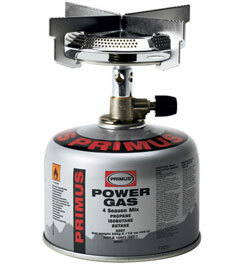 Pocket Stove folds down to compact size. 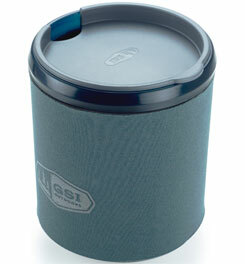 Includes six Esbit 14g solid fuel cubes that burn about 12 minutes each and are carried inside the stove. Esbit fuel is non-toxic, environmentally safe, has no ash residue and is nearly odorless.Two-position design permits a low flame for controlled cooking or a direct flame for a quicker boil time. Wt. 3.5 oz. Available from different manufacturers and in different styles I have found few diffrences amongst the several I have tested. Aim at one priced $25.00 or less.